What happened when (Monkees producer and Turtles member) Chip Douglas, Linda Ronstadt, Gram Parsons, Gene Parsons, Howard Kaylan, Henry Diltz, Cyrus Faryar, and (probably) Micky Dolenz' Moog synthesizer got together in '67? This beautiful piece of folk-rock melancholy holiday sound was born. Unjustly obscure, in a perfect world this is the type of record that would be heard everywhere during the holiday season. Christmas arrived early this year, in that I found a copy of this record (that I've been chasing for many years) back last July. 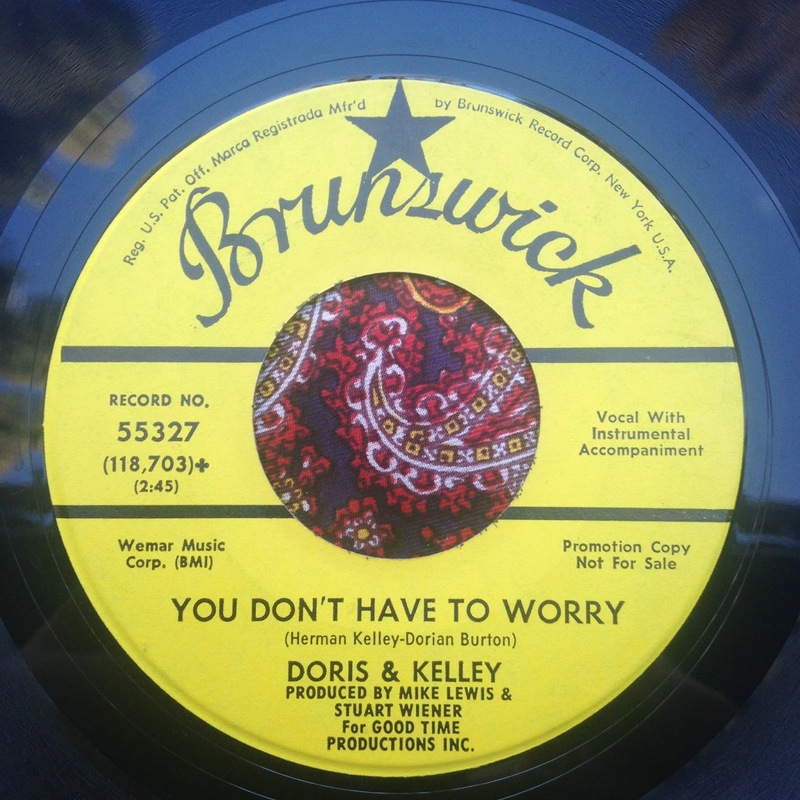 Issued both in 1976 (to the fan club in limited numbers) and again in 1986 (this copy), this single hardly ever turns up for sale because both pressings were so limited, and most people tend to hang onto them. I have no idea where the '86 release was even SOLD, as I was both a Monkees fan and reading Goldmine magazine as a youngster during this era and I never remember seeing it for sale, and certainly have never seen it in any record stores. Perhaps producer Chip Douglas repressed it for the fan club only, I'm simply not sure. I've had both sides of this 45 on a lo-fi bootleg LP for over 20 years, but nothing beats having this copy with the uber-cool picture sleeve showing the fellas in the studio, reunited. 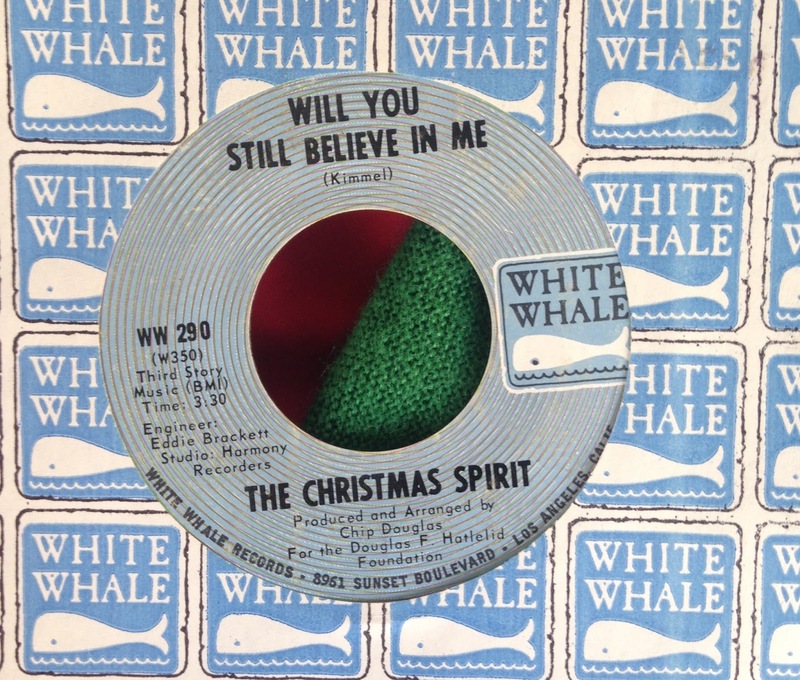 Chip Douglas and (Turtle) Howard Kaylan wrote the song back in 1968, and it was issued as a single by a group calling themselves The Christmas Spirit, which was made up of several Turtles and Linda Ronstadt. While the song was revisited for The Monkees version, it was completely re-arranged in a far superior way for their track, which is pure magic. The group was unable to use the name Monkees due to legal restrictions, so the record was cleverly released as We Three Monkees. Michael Nesmith chose not to participate, but the rumor mill claims that it's none other than Nez playing pedal steel guitar on both sides. Micky and Davy take turns on the lead vocal, which is heartfelt and lovely, and the song itself is a wonderful thing. What's in the grooves makes it obvious that everyone involved was having a ball when they made the record. Davy takes the lead for a very moving, country flavored version of "White Christmas" on the flip side, which shows how this man could croon with the best of them and how missed he is. The words written on the back of the picture sleeve, "An expression of friendship and togetherness to make the holidays a little brighter for all of us" couldn't be more spot on. Whatever it is that you celebrate, I wish you peace, love, and happiness today, tomorrow and everyday. 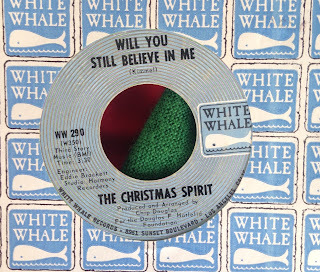 One of the prettiest, yet little known soul Christmas singles. 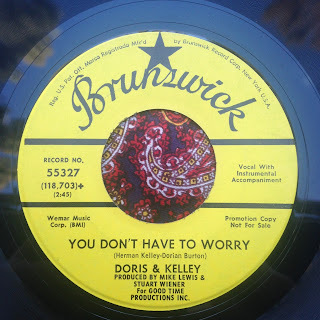 I'm not sure if this Betty Lloyd is the same singer who was a member of the east coast girl group The Percells; Thomas Records was a Chicago label (an offshoot of Curtis Mayfields' Curtom label), and this track certainly has an indelible Chicago stamp on it. The lyrics brilliantly capture the feeling of being alone at Christmas, but without self pity. Oozing with quality, this song should truly be a holiday standard. I'm not one to pick favorites of anything, but this 45, along with The Staple Singers staggeringly beautiful Twenty Fifth Day Of December are my favorite holiday records. 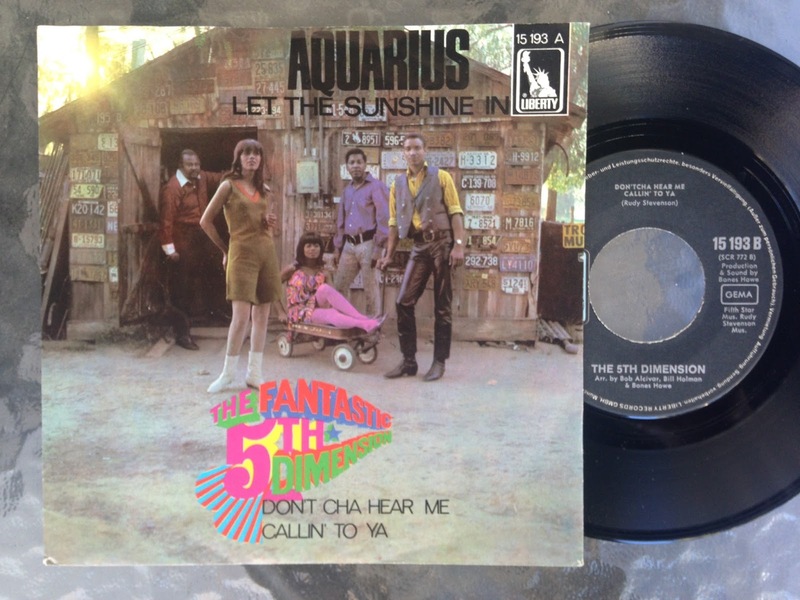 I didn't say much about the a-side on my original post, but the real story is in the grooves. It's a wonderful song, played and sang with exceptional talent by this excellent group that deserved mass fame. One area that wasn't explored very deeply by US garage bands was the Christmas record; however, Chicago's Saturday's Children were way too sophisticated to be called a garage band. Here, the band (deeply influenced by the Beatles) melds "Deck The Halls" with Dave Brubeck's jazz standard "Take Five' and turns it into a jazzy, quasi-psychedelic number that I almost guarantee will bring on some holiday cheer. This group had an incredible knack for harmonies, and tackle the tricky 5/4 time signature with ease making for the most hypnotic Christmas record I've ever heard. The other side is an exceptional holiday original showcasing their excellent group harmonies and songwriting skill. I don't know what was in the water and air in Chicago & Detroit during the 60s, but whatever it was it propelled soul and rock music into the stratosphere, with massive amounts of high quality records being released. File under: Greatest B-Sides to a massive hit single. I make no bones about the fact that I love the hits as much as the rarities; it's all music that makes us feel good, and just because millions of people happen to dig something collectively, that doesn't make it any less beautiful (I always have to excuse myself to get a glass of water when someone starts rambling about how any popular music isn't as good as "X"). So, yeah, I love the A-side of this record, and the lightweight pop-soul of The Fifth Dimension was pretty darn groovy. The b-side, though, is a STONE GROOVE! LA's finest session musicians GET DOWN, and of course this groups patented vocal blend is heard in supreme form. The song, too, is unique - pushing aside conventional chord changes, it keeps modulating higher and higher, echoing the yearning sentiment as heard in the lyrics. When this one comes on during long drives, it's pretty much a guarantee that I'm gonna repeat it a few times, 'cause it's just *that* cool. While it isn't a secret that Dwight Twilley is one of the all time great power pop artists, this very scarce track is a bit of a secret psychedelic mini-masterpiece. I first heard this song on the excellent Great Lost Twilley Album CD that I was fortunate enough to snag from the record store I worked at in the mid-90s before it disappeared and became a pricey collectable in the days when out of print CD's actually commanded a serious premium. I couldn't even begin to guess how many times I used this song on mixed tapes over the years. This record was a bit of myth for me for many years as it NEVER turned up, and I doubted whether a US copy even existed; this is the b-side to 'Runaway', and the relatively common promo copy has mono/ stereo versions of that track, with no 'Burning Sand'. It was a happy day indeed when a copy of this turned up a few years ago, but it almost met a sad fate, as it was sent to me in a non-padded 'envelope' (basically a pathetic job of someone covering it in paper, taping it shut and shipping it). How it made it to me without getting cracked is a minor miracle. 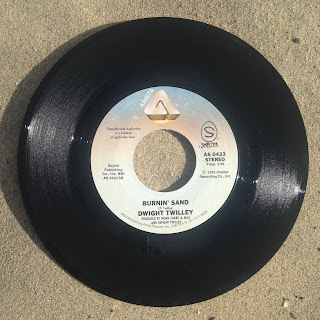 This record has received the most hits to this site, and also has been responsible for the most people writing to me and either asking me to sell my copy (nope, not for sale) or to get a high-res rip off of my copy (undoubtedly since Common sampled this track). One of those wishes is (kinda) granted, as my YT uploads are always the highest possible resolution/ fidelity. Everything about this record sounds STONED. Another day, another mystery record! I am completely transfixed by the psychedelic, deep vibe of this song. Sadly, it appears as if this is the only record that these two made. A pity, but at least we have this one. As always, any information about this record would be greatly appreciated.